For the foodies: Food Chronicles in Mercato Centrale! Skyisthelimit production presents Food Chronicles, a series of food challenges that caters to the food junkies and the people behind the food. Food Chronicles is not your typical food event where people just eat. It is an event for people who appreciate food in a higher level of perspective. Food Chronicles is a journey that is a mix of fun and a search for new taste in the metro. The mission of Food chronicles is to find new kitchen geniuses from the young generation coming from different culinary schools. In line with the mission of Food Chronicles, the highlight of the event is the cooking competition wherein students from different culinary schools will compete to have the grand title of the Kitchen Rumble Champion. The challenge is to find a new way of cooking of home cooked dishes and discovering a fresh new palette for the Filipino Taste. The next competition would be an eating challenge. The eating competition is open for everyone to participate in. The eating competition will have 3 rounds in which contestants will be participating. Every round has its own twist in eating certain food categories. 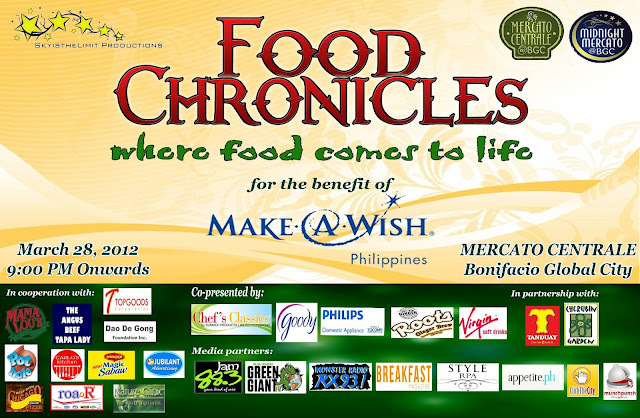 Food Chronicles will be held on March 28, 2012, from 9pm onwards, at Mercato Westgate Branch. This event will benefit Make a Wish Foundation which seeks to help poor children with medical conditions.